Super Luck* Heightens the critical-hit ratios of moves. 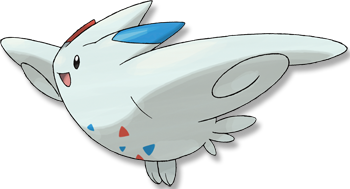 This Pokemon has a higher chance to hit critically..
Diamond/Pearl It will never appear where there is strife. Its sightings have become rare recently. Platinum It shares many blessings with people who respect one another�s rights and avoid needless strife. Heart Gold As everyone knows, it visits peaceful regions, bringing them gifts of kindness and sweet blessings. Soul Silver As everyone knows, it visits peaceful regions, bringing them gifts of kindness and sweet blessings. Black It shares many blessings with people who respect one another's rights and avoid needless strife. White It shares many blessings with people who respect one another's rights and avoid needless strife.